There are days that it is as though I live in the fiery furnace of refinement. Times when I can’t take the heat and just want out of the kitchen. Life can be too much for me. This is an honest confession from a heart that has been broken and healed. It is the cry of a mind that doesn’t always understand the purpose in life but tries to live according to its purpose. Those moments in life that the altar feels real, the ropes binding me there tight and the fire so hot that surely it will consume me. My soul burns for Jesus Christ. No, literally it is on fire to remove anything that might come between us because to be quite candid without Him I will not survive. On those days, I am reminded that He has ransomed me so now I belong to Jesus Christ. He paid the price for my life. It belongs to Him. Jesus calls me by name. When I go through deep waters, though I feel like I am drowning, He will be with me even in the dangerous depths of difficult that I face – I will not drown. It is a promise. Printed in the Truth that is the Word of God – it belongs to me if I will just hold on to it. But water is not the only threat I face in my battle against self – there is the fire of oppression. I will not be burned up or consumed by it although there are times when I can only breathe moment by moment in the midst of tall flames. Am I the only one? Do you ever feel like life is just too much for you? Well, it is. I joke with people and tell them it is my fear of fire that keeps me saved. The true potential of burning to death is too much to bear so I would rather trust the Lord. Well, out of the frying pan into the fire my friend. A life committed to Jesus Christ begins with a burnt offering of all that we are to be consumed by all that He is – that is if you are serious about becoming a Child of God and resident of His Kingdom. Faith carries us through the fire and confident hope meets us on the other side. Are you willing to be a living sacrifice? (Romans 12:1-2) It means giving all that we are to Jesus Christ, and being consumed by God the Father in all things. A bit overwhelming don’t you think until you consider that it is as simple as every single choice that we make in life. Will I serve the Lord and sacrifice my way? Or will I abandon my covenant with Jesus and have my way? God promises two things in the midst of a burnt offering. First, He promises to meet with you. Secondly, He will speak to you there. Burnt offerings are a daily requirement. Jesus Christ is the ultimate sacrifice for sin so no longer is a physical sacrifice needed. Now we sacrifice our life by yielding it to God through the Sacrifice of Christ. Jesus opened the door to the Presence of God for all mankind. It is up to us if we meet God there and listen to what He is saying to us. There the angel of the Lord appeared to him in a blazing fire from the middle of a bush. Moses stared in amazement. Though the bush was engulfed in flames, it didn’t burn up.3 “This is amazing,” Moses said to himself. “Why isn’t that bush burning up? I must go see it.” When the Lord saw Moses coming to take a closer look, God called to him from the middle of the bush, “Moses! Moses!” “Here I am!” Moses replied. “Do not come any closer,” the Lord warned. “Take off your sandals, for you are standing on holy ground. I am the God of your father—the God of Abraham, the God of Isaac, and the God of Jacob.” When Moses heard this, he covered his face because he was afraid to look at God. 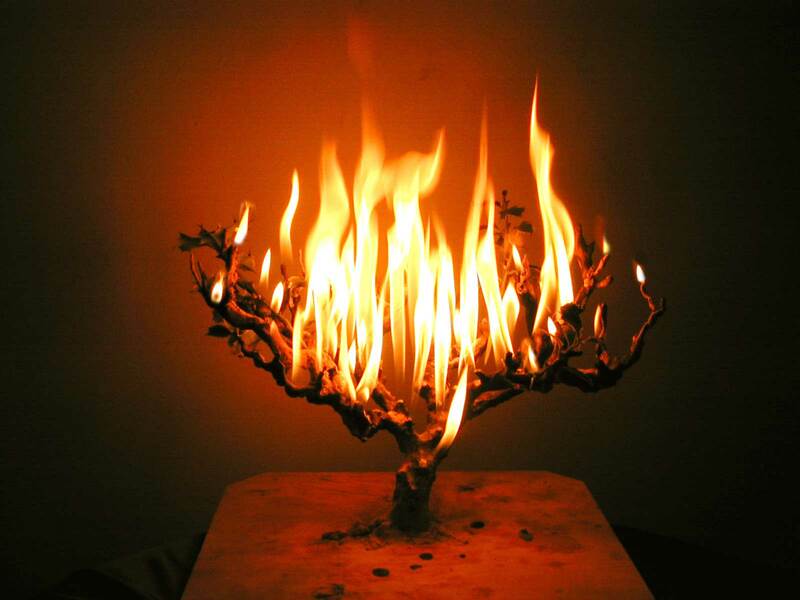 Moses was attracted to the “burning bush” because despite the raging fire it was not consumed but continued to burn. When he made his way to it, Moses encountered the Lord. God spoke to His Servant, Moses, from within it. God told His Man that this was holy ground. The ground on which Moses was standing. Anywhere we live with God is holy ground. We do not have to change our real estate in order to follow the Will and Way of God for our life. God revealed His Identity to Moses in that place in the middle of the desert without priest or preacher. He will do the same for you. Whatever is burning in your life has the potential to be a place where you meet the Lord and He reveals Himself to you. You will not be consumed. He promised that you would not. You must choose whether your life will be a burnt offering to the Lord or a sad sacrifice to self. Those who remain in me and I in them will produce much fruit but those who are apart from me can do nothing. Hmmm…Jesus goes on to say that anyone who does not remain in Him is to be thrown away like a useless branch that is burned. We must remain in Jesus to be productive. But I thought righteousness is not about what we do. It’s not. Righteousness is found in Christ alone. He is the Only One who could reestablish a right relationship between God and man. So how do I remain in the Lord if it is not about my “works”? “I baptize with water those who repent of their sins and turn to God. But someone is coming soon who is greater than I am—so much greater that I’m not worthy even to be his slave and carry his sandals. He will baptize you with the Holy Spirit and with fire. He is ready to separate the chaff from the wheat with his winnowing fork. Then he will clean up the threshing area, gathering the wheat into his barn but burning the chaff with never-ending fire.” (Matthew 3:11-12) The Holy Spirit identifies us as Children of God. But look what else this verse says that we are baptized with fire. Why? To separate the chaff (useless branches) from the wheat (productive harvest). When Jesus comes back, it will be too late to change our heart and mind to become a living sacrifice. The never-ending fire will consume those not identified as God’s Children. No questions asked. We live in a world filled with believers, nonbelievers and those who think they are one but are really the other. Life among the weeds. (Matthew 13:24-30) When Jesus comes back, the weeds will be burned instantly. Only the harvest (true believers who believe in Spirit and Truth) will make it until the end. Will that be you? It all depends on how you make it through the fiery trials of life right now! The Lord is burning away that which is offensive so we will grow productive in His Kingdom. Faith in Jesus Christ secures us in righteousness. Confident hope comes as we tread on the Holy Ground of life step by step following the Lord. Jesus said, “I have come to set the world on fire…” (Luke 12:49) The fires is not to consume you but refine us so we will be productive and make it out of the fire untouched. So Shadrach, Meshach, and Abednego, securely tied, fell into the roaring flames. But suddenly, Nebuchadnezzar jumped up in amazement and exclaimed to his advisers, “Didn’t we tie up three men and throw them into the furnace?” “Yes, Your Majesty, we certainly did,” they replied. “Look!” Nebuchadnezzar shouted. “I see four men, unbound, walking around in the fire unharmed! And the fourth looks like a god!” Then Nebuchadnezzar came as close as he could to the door of the flaming furnace and shouted: “Shadrach, Meshach, and Abednego, servants of the Most High God, come out! Come here!” So Shadrach, Meshach, and Abednego stepped out of the fire. Then the high officers, officials, governors, and advisers crowded around them and saw that the fire had not touched them. Not a hair on their heads was singed, and their clothing was not scorched. They didn’t even smell of smoke! The three Hebrew boys thrown into a fiery furnace to die because they would not bow down to an idol. They were supposed to die in the fire but that is not at all what happened. What the enemy intended to consume them did not touch them. When Nebuchadnezzar called them from the fire after he saw the Lord with them, “not a hair on their heads was singed, and their clothing was not scorched. They didn’t even smell of smoke!” It was clear that the fire had not touched them physically but what it did spiritually that day was monumental. Even the king who created the great image to be worshipped by all, worshipped God in that instant. You may feel as though you are being consumed by the fiery trial that you are facing today. It may seem as if this is the day that you will indeed lose what’s left of your weary mind. Weakness overwhelms you and fatigue sets in. How can I make it another day? I know what you are thinking because I have been there, too. I write to you from the other side of the furnace. I am not disillusioned into thinking that I will not end up there again. But from this side, I am calling to encourage you. I wish that I could say that the fire does not burn something deep inside of you because it does. I cannot lie to you and tell you that it will not change your life because it most certainly will if given the chance. I would love to reassure you that the “furnace” is comfortable because there were days I did not think that I could endure it a moment longer. What I can tell you is this? When I stepped out of this last fiery trial, nothing was wasted. I can tell you with confidence that it was worth it. Servants, true worshippers of the most High God, will find themselves in the midst of the fire in life. It is inevitable. What God does in the fire will amaze you! How the Lord brings you through will bless you! What He tells you in its midst will change you forever! My life is a burnt offering to the Lord today! I am not consumed but confident in His Great Love! My place of employment is headlong in a crazy season at the moment. To say someone turned the heat up is an understatement and tensions are running high as happens in the midst of great pressure. I have a wonderful guy who is our building custodian. He is a believer. When he came to empty the garbage in my office, I handed it to him. I try to be conscious of the job that he does which is often unnoticed thanking him and making general conversation. When I asked, “How are you today?” He turned with a huge smile and said, “I am really good!” I inquired as to the nature of his enthusiasm as it was only Tuesday with a chuckle. His area is one of the ones that is in the midst of problems – but he said that they were not his problems and he had decided to have a good day anyway. I told him that He worked for the Lord anyway and not man. He turned and said, “Someone else had told him that today and that is exactly why he was so happy!” Nothing changed in the atmosphere of our employer but he decided that it would be holy ground and this man was continuing to work for the Lord! He is such a blessing to me without even knowing it. Whatever you are doing today can be a burnt offering to the Lord. You can allow His Fire to burn in you stirred up by the Holy Spirit so that whatever you do will be for Jesus! “The fire will show is a person’s work has any value!” The Lord wants to bless you in your mess today. He wants to give you beauty for ashes. Will you have it? This Holy Ground is called your life. He is with you! He wants to speak to you! Most of all, Jesus wants to spend forever with you!